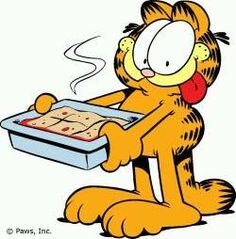 We understand Garfield’s love for lasagna. Who doesn’t love some cheesy pasta? So instead of going out to buy some, why not make your own? There’s nothing more satisfying than enjoying the fruits of your labor! Want to get started? First off, you’ll be needing a bunch of ingredients so head to the store and get what you need! And here’s how you make that perfect lasagna! Preheat oven to 180°C. While doing this, throw the beef into a pot. Add the garlic and onions, and cook in medium heat, while dicing the meat, until they’re all brown. Drain excess grease! Then, throw in all the tomatoes! Crushed, paste, and sauce! Add the water and sugar, as well as the salt and pepper. Let it simmer for 30 minutes to an hour. Stir occasionally! Heat a large pot of lightly salted water. Boil lasagna noodles till your desired softness. (Around 10 minutes, usually. Not too soft, now!) Drain noodles and rinse with water. In a mixing bowl, add some ricotta and/or cottage cheese, plus the eggs, and a bit of salt. When your meat sauce has finished simmering, get out your 9×13 baking dish, and spread 1-2 cups of meat sauce on the bottom. Arrange the noodles over the meat sauce. Sprinkle a lot of different cheeses over the noodles! Then cover the cheeses with another layer of meat sauce. Repeat this process and top it off with all the remaining cheese! Cover it in foil but make sure the foil doesn’t touch the lasagna! Bake it in the preheated oven for about 30 minutes. Remove foil and bake till the cheese turns brown. Leave it for 10 minutes, then serve when cool enough! Are you cool enough for this lasagna?